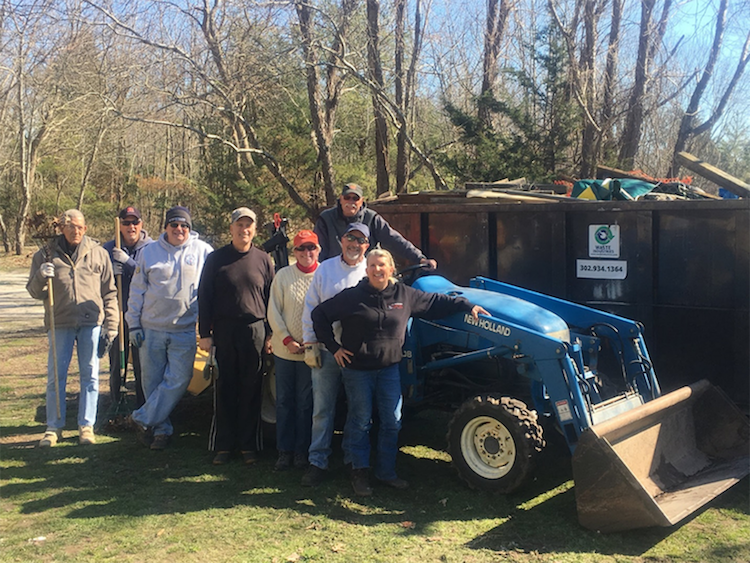 Ocean View, DE- On March 8 th, nine dedicated volunteers with the Delaware Center for the Inland Bays spent 26 hours removing 2.75 tons of assorted debris and trash from the James Farm Ecological Preserve. The Preserve is owned by Sussex County and managed by the Center. Waste Industries of Millsboro (and its Full Circle program) provided the construction dumpster used during the cleanup, and Senator Gerald Hocker graciously sponsored the Preserve for the Delaware Solid Waste Authority’s “Community Clean-Up” initiative. Just like anybody’s yard, the James Farm needed a good “spring cleaning”. What was collected stemmed from two sources: debris that had washed up into the marshes from the Bays during storms (largely wood and fencing) and, unfortunately, junk left at the site by the rare inconsiderate visitor. The James Farm Ecological Preserve serves the residents of and visitors to coastal Delaware and is open all year from dawn to dusk. There is no admission cost. In addition to hosting over 10,000 visits by the general public, and being home to the James Farm Middle School Education Program, the Preserve is also the staging area for many of the Center’s Science and Restoration activities. Visitors are reminded that the facility is carry-in / carry-out and asks that all visitors respect the wildlife and fellow patrons by keeping dogs leashed and picking up after them. If you would like to volunteer at the Preserve, regular weekly volunteer opportunities including trail maintenance, invasive species control, and facility repair take place every Wednesday at 9:00AM. For more details, visit www.inlandbays.org/volunteer or send an email to jamesfarm@inlandbays.org.